DENVER—Mae Boettcher (1912-2001), the longest-serving member of the Boettcher Foundation Board of Trustees, was inducted into the Colorado Women’s Hall of Fame on Wednesday, March 28. Boettcher, who was married to Charles Boettcher II, served as a trustee of the Boettcher Foundation for 43 years. 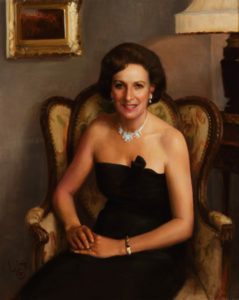 During her tenure, the foundation’s assets grew from $11 million to more than $220 million. Katie Kramer, president and CEO of the Boettcher Foundation, joined by Boettcher’s friend, Bronwyn Bateman, spoke on her behalf during the event. Kramer noted that Boettcher helped guide the Boettcher Foundation’s philanthropy in Colorado and stewarded its investment in the people and organizations making a difference in the state. “She did this with a particular focus on women and girls, and she filled her role with grace, compassion and wisdom,” Kramer said. Read the full entry on Mae Boettcher on the Colorado Women’s Hall of Fame website.